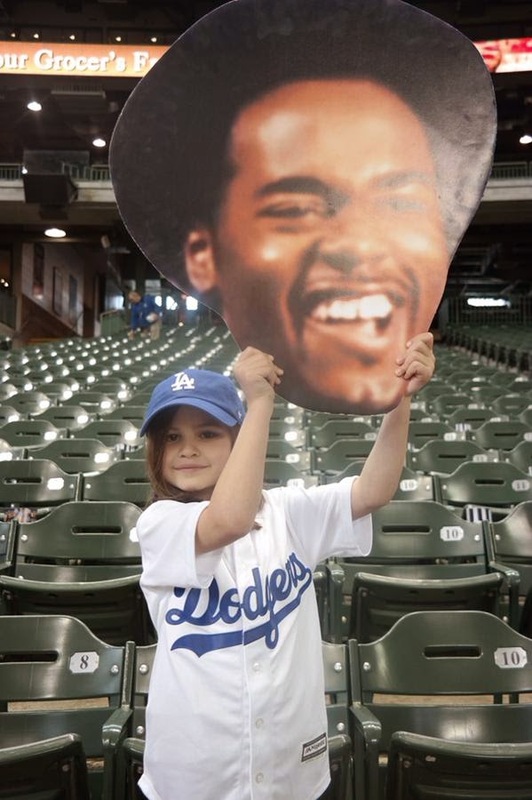 This young Dodger fan in Milwaukee loves Jimmy Rollins... Obviously. With Joe Wieland slated to make his Dodger debut this evening, Carlos Frias will start on Thursday; via Andrew Wagner at ESPN.com. "We feel like it can't hurt to be able to give [Frias] an extra day," Mattingly said. "I'm not really worried about his arm, I just want to give him an extra day." "Down there, we expect anything to happen because just about everything has happened," he said. "You're here one day, you're outrighted. We've also had three or four starters on hold and then nothing's happened. We see it and have come to expect it. It's not as big an issue as it was in the beginning." Q: Where did the bat flip come from? Zack Greinke: It's always there. I just haven't hit one hard like that in a while. Via Jon Weisman at Dodger Insider, "Glenn Burke elected to Baseball Reliquary’s Shrine of the Eternals." BTW, former Topps executive Sy Berger, considered the father of the modern Baseball card, was also elected. Via Mike Spohr at BuzzFeed, "16 Questions With Baseball Legend Tommy Lasorda." There are a couple of silly questions, so get ready to laugh a bit.